Wow this has been a pretty busy season for IPOs thus far. The newest player to join the game is Union Gas Holdings, which will be listed on the Catalist Board. But before we delve into the analysis, let's take a look at how the recent IPOs fared. - IPO closes on 19 July 2017, 12 noon. Union Gas Holdings (UG) is a well-known household name that most of you should be familiar with. Its business consists of supplying bottled liquified petroleum gas (LPG) to households in Singapore, compressed natural gas (CNG) to retail and industrial customers, and it operates a fuel station at 50 Old Toh Tuck Road which also carries diesel. Photo Credits. This is a coin bank but you get my drift la. 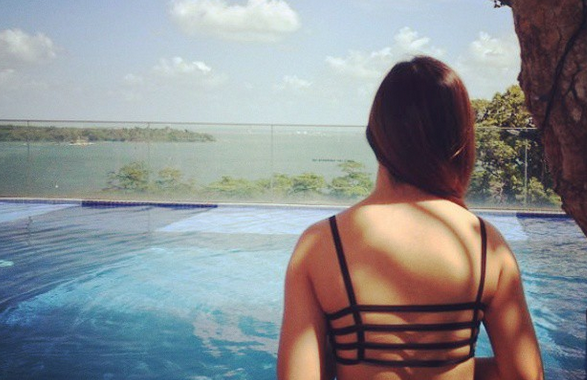 They're a familiar brand name to most people so there's no need for much introduction. If you read the IPO prospectus, the numbers and outlook does look pretty rosy. But we'll dig deeper into the downsides later on, let's look at the strengths of this company first. They're a leading supplier of bottled gas. 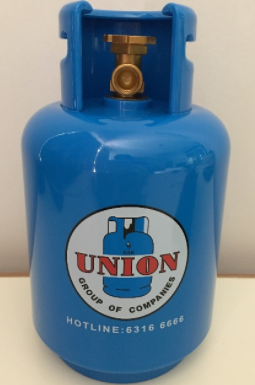 Union Gas supplies their bottled LPG to over 140,000 households in Singapore, and is one of the market leaders in the CNG space. There's no doubt that they have strong brand equity which is an economic moat for their business. Their financial statements are healthy. Even though their revenue has been dropping, their profits have actually been on the rise, and their compounded annual growth rate (CAGR) over the last 3 years is 27%. Pretty impressive figures. Potential growth of new businesses. Their diesel arm has been growing steadily with an impressive growth of over 600% in just two years! With more consumers moving to diesel and electricity, this is one area you'll want to watch closely as a shareholder while you monitor its growth story. Management has also shared their plans to expand into offering household and health products using their existing fleet of delivery vehicles. However, as this is still a relatively new field for Union Gas, I am less optimistic on how this new business will turn out and will prefer to take a more conservative stance for now. 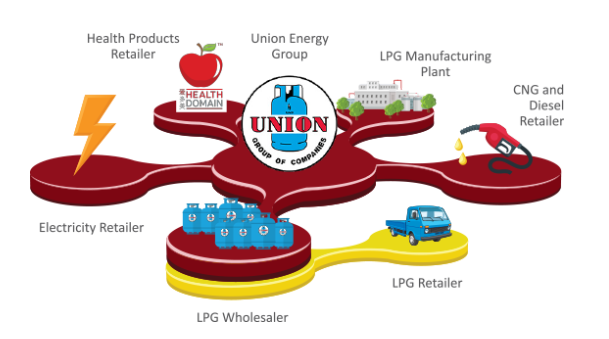 Union Gas derives majority of its income from its retail LPG and CNG business, but unfortunately this has been steadily declining in recent years. Take a look at the revenue breakdown below. LPG revenue has shrunk by 14% in 3 years, largely due to structural changes as customers shift away from bottled LPG to piped town gas. We've seen this happening in the hawkers and coffee shops, leaving Union Gas with mostly landed homes as their remaining customers now, but it is likely that this will soon be gone as well due to redevelopments of new households in Singapore to piped gas or electricity. Its CNG business looks even worse with a 52% decline! This is because their customers are mostly CNG-powered taxis, which are slowly phasing out as more vehicles switch to diesel or electric models. The 70% drop in CNG_powered taxis in the last 6 years will surely continue so we can expect even worse revenue figures for Union Gas' CNG division in the coming years. Only the diesel segment looks promising, but can they really succeed? 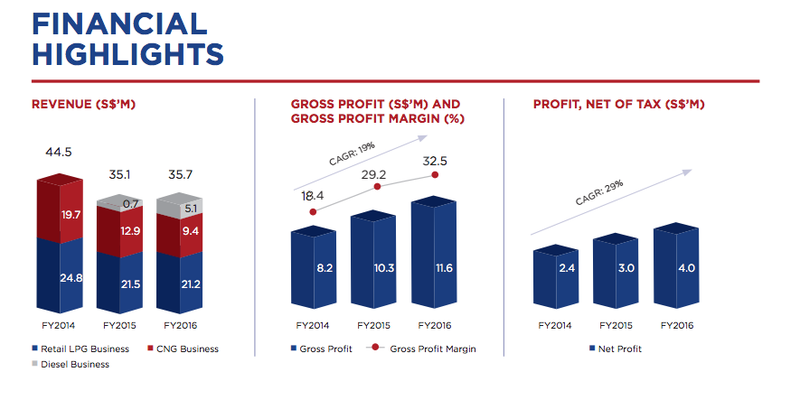 Did you find it odd that their revenue decreased but Union Gas actually reported a growth in net profit over the last 3 years? So did I. I dug deeper and finally saw a portion that explained the increase in GPMs between FY2014 - 2016 were attributed mainly due to a drop in raw materials cost of purchasing LPG and CNG, which was more than their selling price reductions to customers. This may or may not continue, so I'm not entirely sure how much longer their GPMs can grow based on this method. If you like asset plays, this would fail the test. Union Gas' main assets are its fleet of delivery trucks and the fuel station at Old Toh Tuck Road, which they technically do not even own as they're leasing it. In the event that the business were to be liquidated, these assets would hardly be worth much. The main question we should ask is, why isn't the most significant asset, its LPG bottling plant business, part of this IPO? In other words, it looks like what the founder has done is to carve out the LPG, CNG and diesel business from UEC for this IPO, and left out the LPG manufacturing plant business. We're thus buying into an IPO company that continues to purchase gas from UEC for its LPG cylinders. Confused? I'll explain this later under the related transactions portion. The company relies heavily on foreign workers and will thus be affected by any changes in employment laws governing foreign labour. With MOM recently enforcing the foreign to local employees quota and other levies, this is another risk to watch out for. They purchase natural gas mainly in USD whereas their sales and revenue are in SGD. 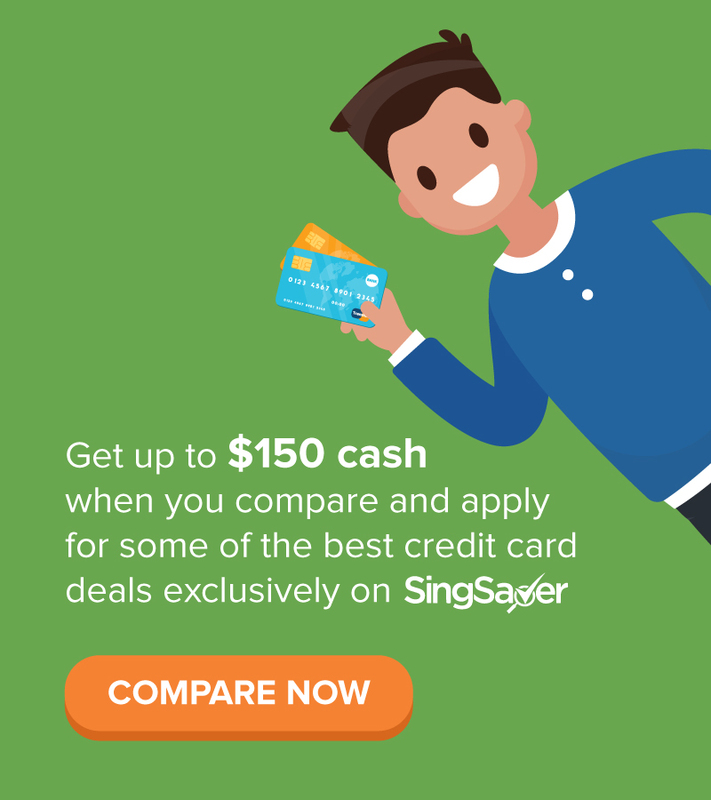 If the USD were to appreciate against the SGD, their cost of operations will rise and there is no guarantee that they can successfully pass on the higher prices to customers. 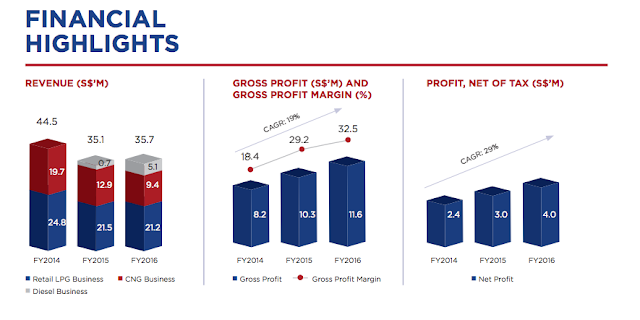 Union Gas intends to distribute 50% of its net profits to shareholders in FY2017, but note that it does not have a fixed dividend policy so who knows what will happen in FY2018 and onwards. If Union Gas fails to purchase the pre-agreed quantity of LPG and CNG every year, it will have to pay for the difference (specifics were not provided). With lesser demand for LPG and CNG in the market, this could be dangerous unless the quantity is reduced accordingly but I was unable to ascertain any indication of the pre-agreed volumes (see pages 118 - 119 in the prospectus). Ok, here's where it gets interesting. Are you ready? If you take the time to read through the entire 400 pages of its IPO prospectus, you're probably confused at all the overlapping relationships. Let me try to break it down here. LPG is purchased from their supplier Sembas --> owned by UEC --> owned by its founder. 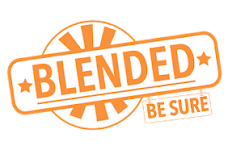 The supplier contract terms are none too favourable to Union Gas Holdings either, as it mandates that if Union Gas fails to purchase the pre-agreed quantity of LPG and CNG from its suppliers every year, it will have to pay for the difference in shortfall. This can be dangerous if the contracts are not revised every year to adjust for the definite drop in market demand for their products, but I could not ascertain any indication of such contract revisions nor the pre-agreed volumes in the IPO prospectus. If anyone can shed some light on this portion, please do share! The bulk of Union Gas rental fees also goes towards paying Sembas (which is owned by UEC) for their office and warehousing needs. This amounts to $70,000 every year. Sounds like a case of from left pocket to right pocket? 1. Acquire dealers for their retail LNG business to grow their customer base. She describes the current market as fragmented and sees opportunity for Union Gas to be the leader who consolidates the industry by acquiring the smaller players. She cites this as the "fastest" way to grow. 2. To launch and grow their natural gas business. Union Gas also recently obtained a regulatory license which now allows them to supply natural gas, and they intend to grow this new segment of the business, targeting the F&B industry in particular. Why was the LPG bottling plant left out of the IPO? If we buy the stock, we're only paying for its tangible assets of delivery vehicles and a (leased) fuel station, which aren't worth much. It would have made a lot more sense if the LPG bottling plant was included in the business. At 25 cents, is the stock overvalued? P/E: 12x (using 2016's adjusted EPS of 1.98 cents). Please don't use the pro forma EPS (which would give you the misleading result of 6.95x P/E) given the decline of Union Gas' existing businesses. P/NAV: 4.5x (using audited NAV of 5.46 cents), but as mentioned above, I would argue that their assets aren't worth that much so I'll take this with a pinch of salt. Given the structural headwinds faced by its business, I feel that even at 12x P/E, valuations are too high. Who benefits the most from this IPO? Could it be the founder? After all, he gets to divest 30% of his shares in this IPO while keeping the crown jewel of their LPG bottling plant. I'm not comfortable investing in a declining business. CNG and LPG are slowly but surely being phased out and it still remains to be seen if Union Gas can replicate its previous success in the new market of diesel and natural gas. I would rather wait on the sidelines for signs that they'll be successful before I put my money in. But given the strong brand equity as well as the limited public tranche, I have a feeling this IPO will debut to see its stock price rise. 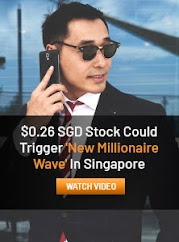 I'll be applying this IPO with the intention to sell in the first few days. If the company starts showing signs of succeeding its new businesses after a few quarters / years, I may then look for another chance to buy in for the longer term. You can read the IPO prospectus here.